Ohh happy days, I nearly forgot to open my pincushion from the. Lovely Sue!!!! Isn't it gorgeous, tis an Anni Downs design, who I just love!!!! And Sues first attempt working with wool.....such a gorgeous job!! thank you soo much Sue! 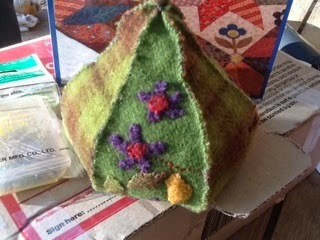 And I sent this pincushion to the lovely Marina with a few goodies. Thank you to Susan who organised this great swap, big hugs!'!! what a delicious pear, love the wools used. And of course love my gorgeous pin cushion the bestest! What a gorgeous swap both of the pin cushions are beautiful. Both pin cushions are lovely Deb. 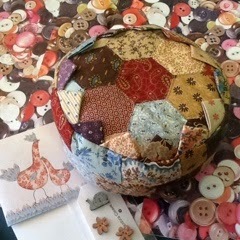 Both pincushions are beautiful...love Annie's designs too and Marina will be so happy with the hexies! They are gorgeous! Nice swap!!! They are both lovely. I'm enjoying seeing all the different designs. 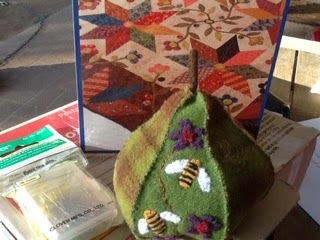 Wow what a gorgeous wool pear Deb! Love the one you made too, looks like one to really fall in love with. WOW! I LOve that pear!.. well done to Susan!.. love the one you made too!